As an experienced metal roofing services provider with a national footprint, McElroy Metal can meet the needs of roofing and construction operations throughout the USA. We offer a broad assortment of metal roofing products manufactured from first-rate materials that enable you to deliver high-quality results to your customers. You’ll also receive the attentive, focused service you would expect from a family owned and operated company that still believes in old-fashioned values like honesty, integrity and treating people with respect.McElroy Metal operates more than 20 Service Centers across the United States, including a state-of-the-art facility in Fenton, MO, just outside the great American city of St. Louis. This enables us to effectively serve our extensive distributor network and other construction industry professionals located in St. Louis and the surrounding areas. Commercial and residential roofers and property owners in Fenton, Missouri, and throughout the St. Louis area are discovering the many environmental and energy-saving benefits of going green. We offer multiple metal roofing products that support solar power and other eco-friendly building initiatives. These products will enable home and business owners to lower their energy bills and meet their goal of being good stewards of the environment. Unlike some of our competitors, McElroy Metal does not believe that a one-size-fits-all approach to metal roofing products serves the best interests of our customers. We’re able to develop solutions to meet your specifications. We will work closely with you to design and implement the custom solutions that will maximize your project. If you’re thinking of installing a metal roof on your Fenton-area home or business, our fun, user-friendly online visualizer tool allows you to envision what your new roof will look like before you buy. You’ll be able to make your own customizations at no charge, or have a design pro handle the task for you for a nominal fee. You can also kick-start your imagination by viewing the wide selection of sample designs. Our Fenton Service Center staff adheres to the same core business philosophy of quality, service and performance that has guided our company over the past 50 years. Delivering reliable support has been the driving force behind McElroy Metal since Thomas E. McElroy Sr. founded our company in 1963, and has continued under the leadership of Tem and Ian McElroy, our second and third generation of family ownership. Our employees share our commitment to service — we’re always happy to answer your questions and even help you brainstorm creative solutions. 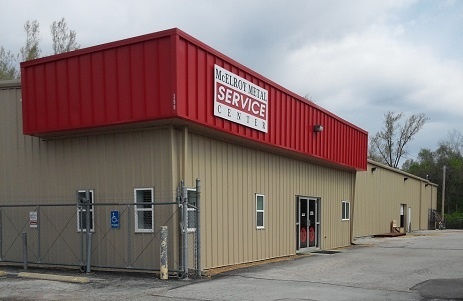 We invite you to visit the McElroy Metal Service Center located at 390 N. Valley Dell Drive in Fenton for a closer look at our metal roofing and products to meet our team. Feel free to give us a call whenever you need assistance or want more information about our metal component product lines.